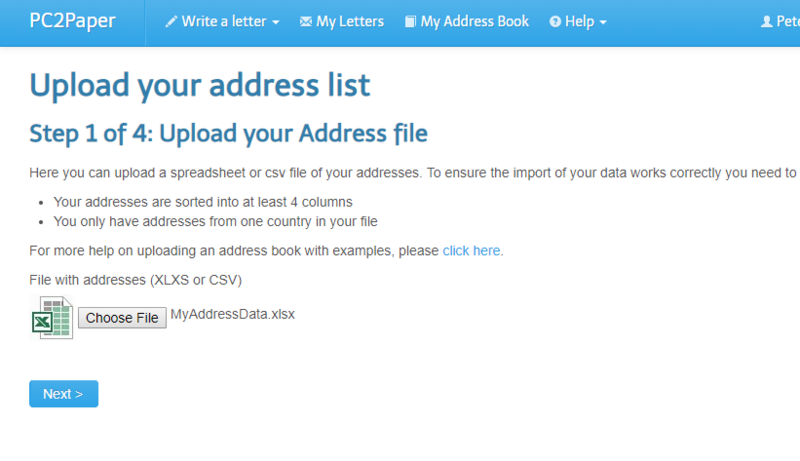 or you can upload your addresses and use PC2Papers online Mailshot tool to send your letters. This article deals with uploading addresses into PC2Papers online addressbook which is used with the Mailshot tool. If you are unsure on what tool to use, please refer to our article How to send multiple items of mail article. In order to upload addresses to your PC2Paper Address book you need to ensure you have roughly 4 columns that can be used in your mailing and that your address data is from one country only. As illustrated below, we are using Microsoft Excel however you can use any spreadsheet program that support the CSV format. We support both Excel files and CSV files. In this step you will need to match your columns onto ours. The system will have a good guess at determining what columns to use from your spreadsheet. Note how you can only select one country per address list upload. If you wish to upload multiple countries to the same address list this needs to be done in separate files. When you are done click Next. On the next step give your Address List a name so you can find it later and then click next. You have now completed uploading your address list. You can review your uploaded addresses or start a Mailshot. To learn how to send a Mailshot with your address list details click here.